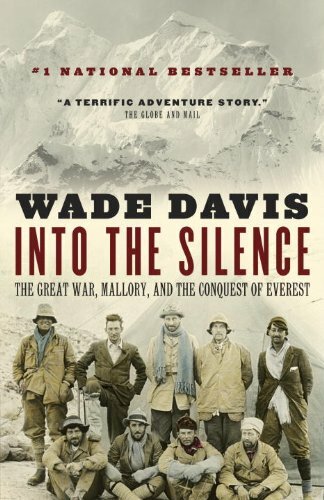 Wade Davis, Into the Silence: The Great War, Mallory, and the Conquest of Everest. Knopf Canada, 2011. I don’t like the thought of mountain climbing; it makes my palms sweat. I do like Wade Davis. That would explain why I picked up a hard cover edition of this 578-page behemoth a few years ago at my local Book City. Thinking back, I was probably also very attracted to the “Great War” part of the title having been on a World War One kick. Despite the subject matter’s initial lack of appeal, it grew on me. Remembering back to The Wayfinders (which I sometimes use in HSB class – Challenge and Change in Society – to introduce the discipline of anthropology) I recall Davis’ beautiful way with words. Sentence construction, or rather, poor sentence construction, can be a real stumbling block for me in getting through a book. Not so this one. Davis is sleek and clever without being pretentious. Even when the subject matter is pretentious it doesn’t seem so, such as the detailed descriptions of the snooty English public school educations of the lead characters. Or the champagne that they ship across the world to be carried up Mount Everest by Sherpas. The Great War is part of the subtitle but really deserves top billing. The war in which most of the climbers of the first three British expeditions in the 1920s fought is the glue that binds them all and sets their characters. In that sense it’s the context of the story. However, it builds to so much more. Getting to the summit becomes a battle in itself, three times: classic “man versus nature” stuff (weren’t we all taught that it’s one of the universal themes of literature back in grade seven?). It turns out that it does make for a gripping theme. At first the mountain-climbing-phobic reader finds little interest in the actual expedition. Drawn in bit by bit, or rather foot by foot or camp by camp, the loyal reader is nearly cheering for Mallory to reach the summit even though the tragic end is already known. Biting wind, blinding sun on snow, inept supply chains, broken oxygen apparatus – they cannot defeat the experience and sheer will of Mallory. In the end it’s not about conquest of nature. It’s about respecting the power of the mountain. Without shoving that theme in the reader’s face Davis makes the point. Davis also uses an anthropologist’s eye combined with a historian’s brain to reveal the ways the British perceived the Tibetans and their seemingly strange rituals. Being the master of all trades, Davis additionally highlights the photographic firsts that occurred on the mountain and the lengths that photographers went to to take and develop their breathtaking shots. Since I read The Wayfinders I have said that Wade Davis has the perfect job: National Geographic writer and photographer. As a history teacher, sometimes anthropology teacher, and very amateur photographer, I am jealous. ← Alone during Earth Hour?